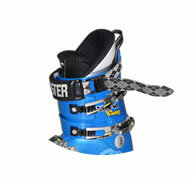 The Booster Strap replaces stock straps with an engineered elastic device that aids boot flex and rebound. The end result is like adding extra muscle to tired legs. Edge hold, rebound and carving power are all enhanced. Bode Miller and Ted Ligety, among others, find this enhancement indispensable. As do we . . .